Semi Homemade Chicken Pot Pie | Not just for chicken! A great way to use up some of the leftover Thanksgiving Turkey! Tastes just like you made it from scratch! With big pieces of chicken, a cream gravy and a crispy topping no one will know or even care that everything wasn’t made from scratch. A delicious hearty meal that will warm you from the inside out! 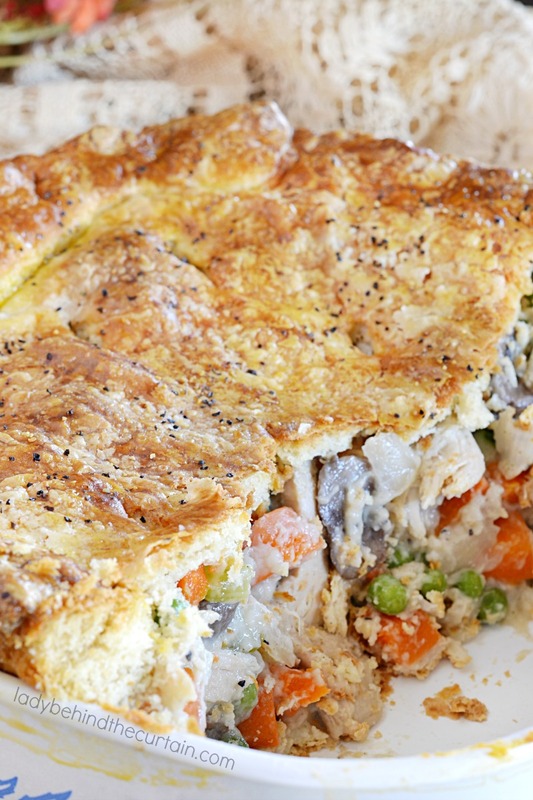 You don’t have to buy high sodium frozen chicken pot pies anymore! This is the perfect meal to take over to a elderly couple. Take it to them hot fresh out of the oven, leave the dough raw and freeze the pie before taking it to them for a meal they can enjoy some other time. Also, this pie can be divided into smaller pies. This is great for those of us that can’t eat a whole pot pie in a few days. If you love all the flavors of chicken pot pie but want something a little different you can try my CHICKEN POT PIE SOUP! 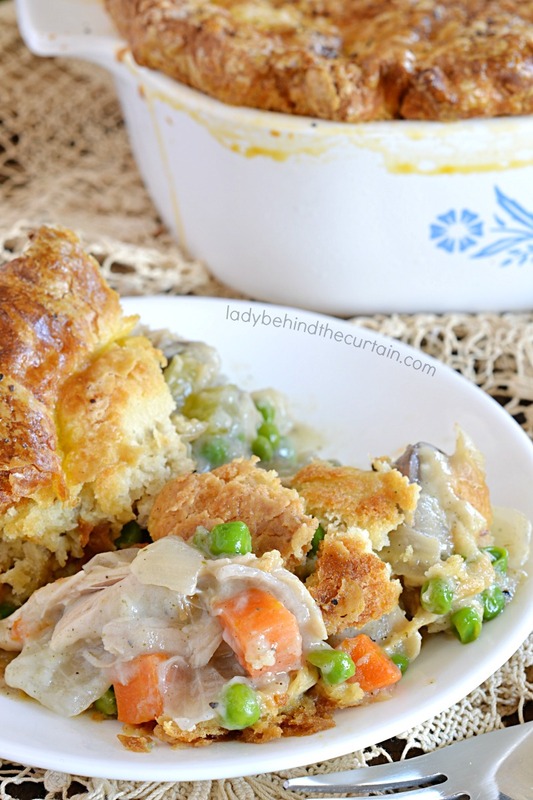 This hearty soup has everything you love about chicken pot pie and more! Certainly a delicious way to warm up during the cold winter nights. 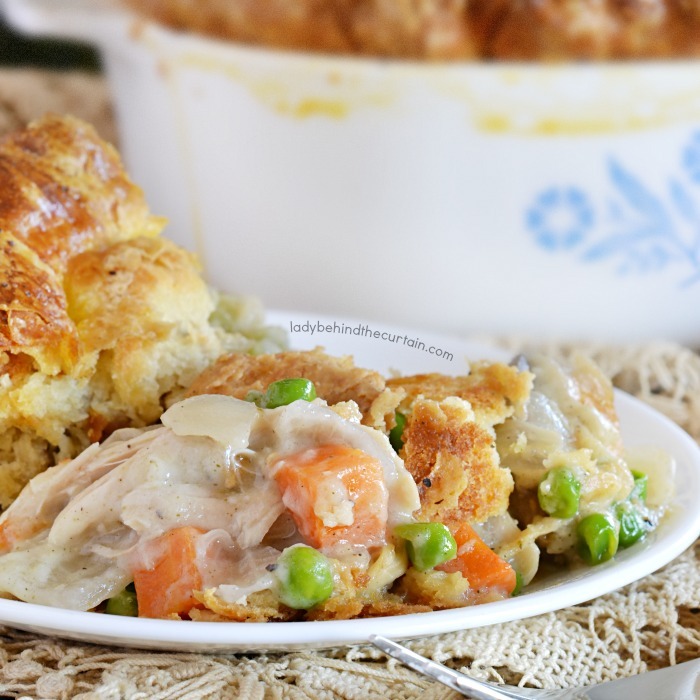 Also…click here for a homemade version of this Semi Homemade recipe—->>>>GRANDMA’S CHICKEN POT PIE. In a large skillet, melt butter, sprinkle flour over butter and mix until smooth; cook 1 minute. Stir in broth and cream. Simmer until thickened. Add poultry seasoning, salt, pepper, onion, carrots and mushrooms. Turn down heat and cook until vegetables are tender (about 2 minutes). Stir in peas and chicken (about 2 1/2 cups). Press 5 biscuits in the bottom and up the sides to the top of a 2 quart baking dish. Pour prepared filling on top of bottom crust. Roll remaining 5 biscuits large enough to hang over the top of the baking dish. In a small bowl whisk together the egg yolk and water. Brush to top of the bottom crust, add the top crust, fold the top crust over the bottom crust to create a seal and crimp. Brush the top crust with the egg wash. If you want, add a sprinkle of salt and pepper. Cover with foil and bake 10 minutes, remove foil and continue baking for 20 minutes or until the crust is golden brown. 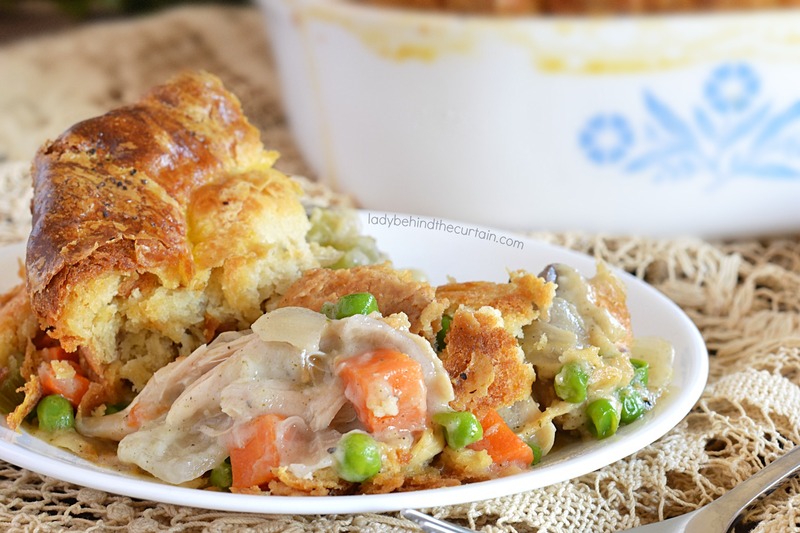 More chicken pot pie recipes you might like. HEALTHY CHICKEN POT PIE and FAST CHICKEN POT PIE.